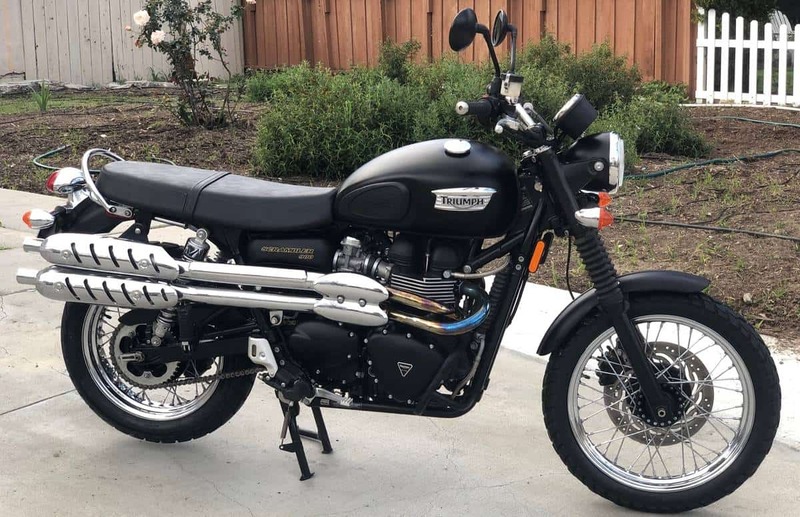 Here we have a great deal for someone out there, a 2012 Triumph Scrambler 900 that is as reliable as a Swiss watch and ready to ride on home to your stable. Its Tagged until November 2019 so that means you can sling your leg over this steed and take her home right away. 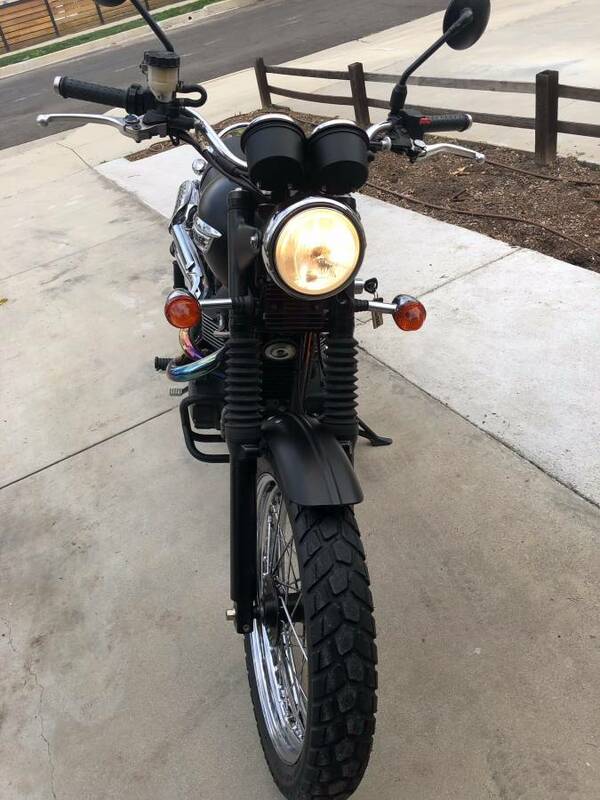 This Scrambler is a fun bike to ride, I have my own that I really enjoy blapping around on and this particular steed has been looked after, it has 9000 miles on the odometer and has a full Service history too, with all the Original Documentation. Having the Matte Black is cool, I believe they only did the Matte color for 2012, the rest were all gloss, so a unique opportunity here just for the color option. It has some nice factory extra’s such as the never usually seen Main stand, it has the neat triumph Chrome double grab bar, as well as the Black Engine dresser/protector bars that are a handy feature to have on your machine. This runs really well like a tight wound wristwatch, No oil leaks and no noises that should not be there, ridden by a Motorcycle rider that has been in the saddle for over 30 years, never thrashed. new oil and a smooth transition through out the gear change. The Clutch bites strong as it should do, no chatter etc. 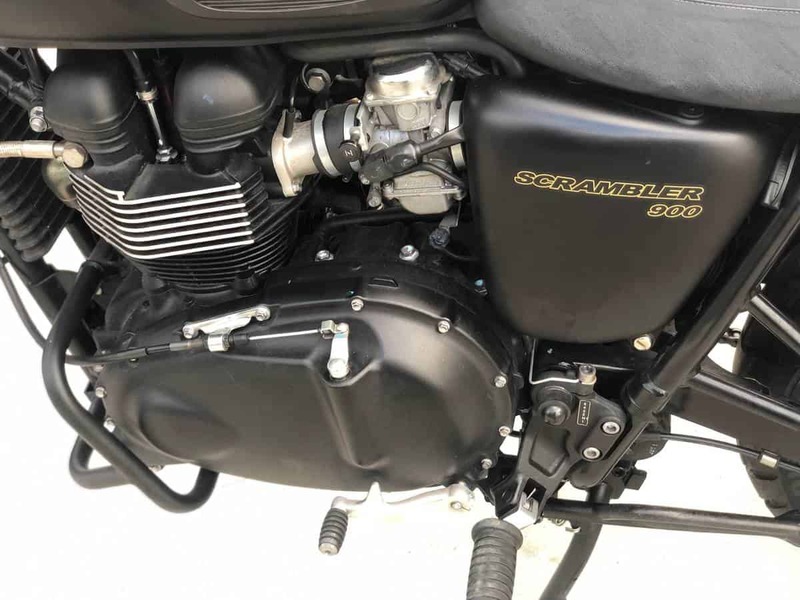 This One Owner Scrambler has been looked after, garaged at night and never thrashed, it is a really well looked after machine that you will enjoy, the Black on Black Livery is so suited to this Triumph and the un-torn seat shows how much this motorcycle was cared for. The Chain is adjusted correctly and always put away in a Garage. Runs like a top, well maintained and you will be glad that you chose this Triumph over many you see out there these days. Check video Below for more great pics of this Scrambler. 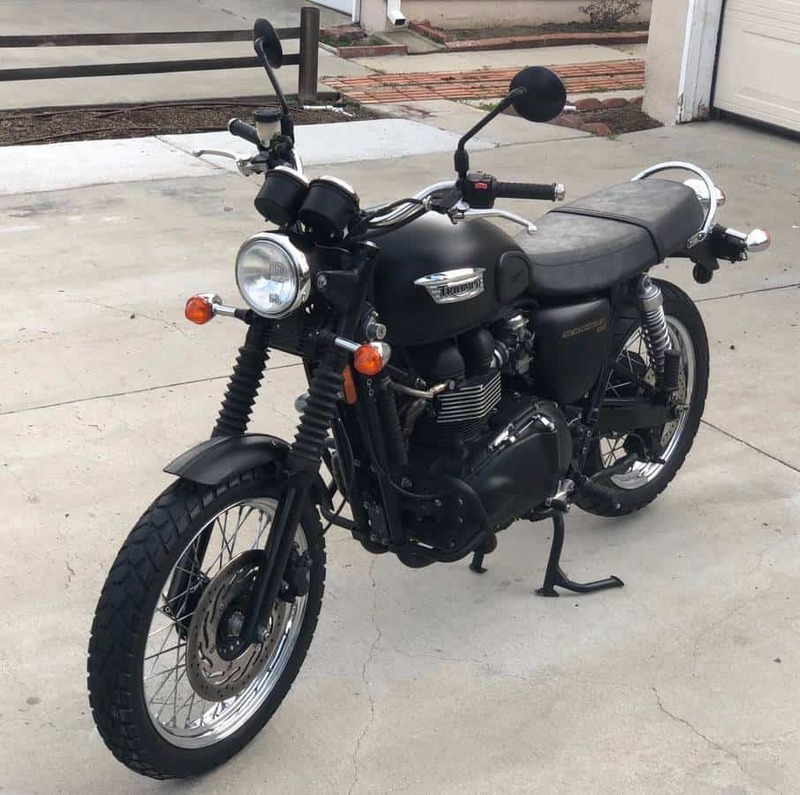 So much Motorcycle for the money and you will be more than happy when you fire this up and take it home, reliable, fun and stylish, I love my scrambler and this is a great deal for someone. I will add another video at the bottom of the page for you to take your own time in looking at this 2012 Scrambler. 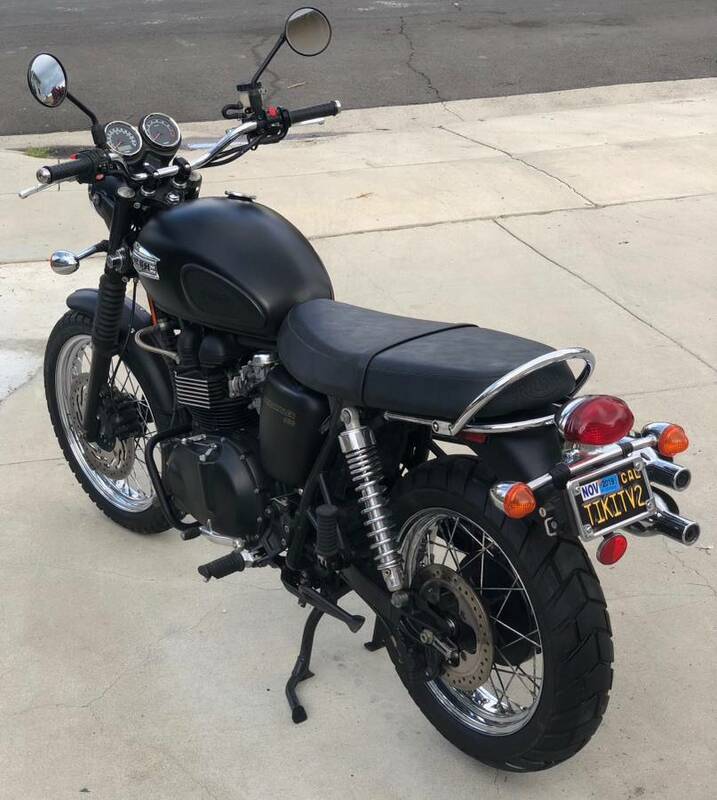 This is a great personal friend of mine and I know the history of this Triumph, I see so many out there and go to look at them and its nothing like they portray, this is a great bike and well worth the money and wish I had seen this when I was looking for mine. Whether its a local Commute to a long ride out in the Canyons, this Motorcycle was made to do just that and more, you wont see many with a Main stand either. Call 310-570-0856 for more information on this great deal, you will not be disappointed. matte Black gives a stealthy look, this Thoroughbred will give you many miles of smiles, it is in remarkable condition for its age and has Normal wear and tear from riding but no dents and gouges etc. Call for any more information and come check it out. 310 -570-0856 Look forward to hearing from you and thank you for taking your time to reading my For sale advertisement. The 2012 Triumph Scrambler harkens back to the days when stripped-down desert sleds of the 1960s were in vogue. Fast forward to today and you have an off-road traveler that likewise boasts of a modern road-based package. The Scrambler takes its inspiration from those old Triumph ISDT machines that were once famously ridden by Steve McQueen with its classic styling dominated by twin high-level exhausts, designed to provide maximum ground clearance on rough terrain. The design of the bike is pretty old school, only adding to its modern-day appeal. The utilitarian style is highlighted by the two simple single-color options, with a new Matte Black option joining the popular military-style Matte Khaki Green. 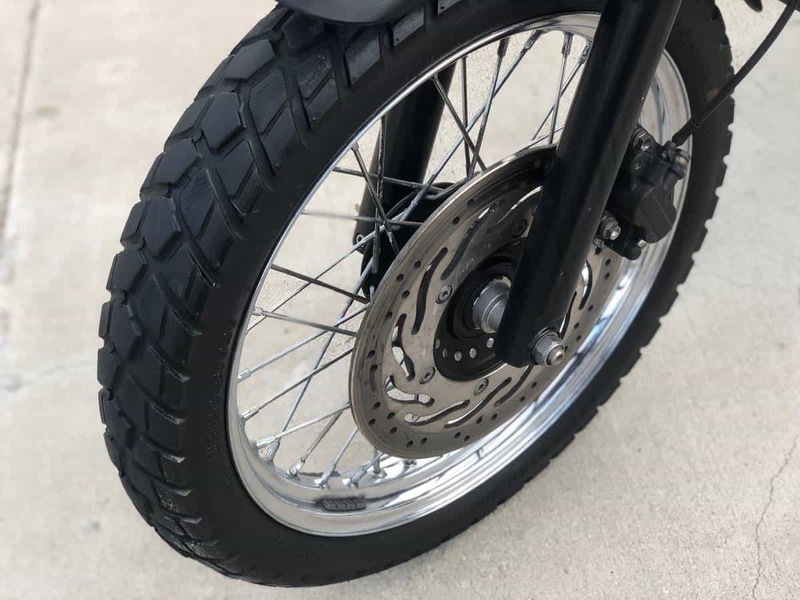 Likewise, the spoked wheels with lightly knobbed tires, high footrests, rugged fork gaiters and wide, off-road style handlebars give a further nod to the Scrambler’s off-road heritage. Then there are items such as headlight grills, skid plate, and number boards, all of which adds even further resemblance to the ISDT models of the 60’s. Powering the Scrambler is a unique version of Triumph’s 865cc parallel-twin engine. Designed outwardly to look like a classic 1960s twin, this DOHC eight-valve unit is a low-maintenance modern engine developed to meet the most stringent emissions regulations. 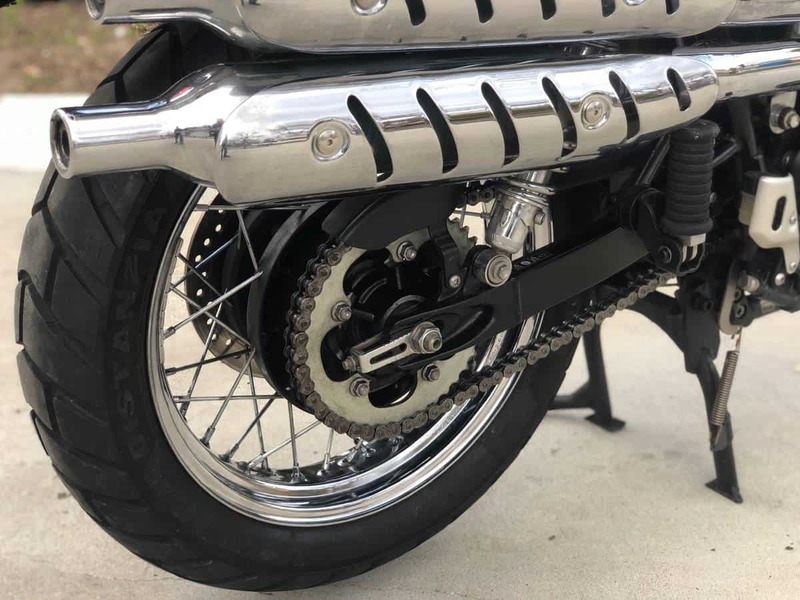 The fuel-injected twin delivers a laid-back output of 58 brake horsepower and 50 lb/ft of torque at just 4,750 rpm, making the Scrambler a versatile ride that can tackle a number of riding conditions. With its 270-degree crankshaft, the Scrambler takes on a totally different character to the other models in Triumph’s classic range, producing a totally addictive off-beat soundtrack which can be cranked up a notch and enjoyed just like those old mavens that used to run wild on the roads and highways of the world. 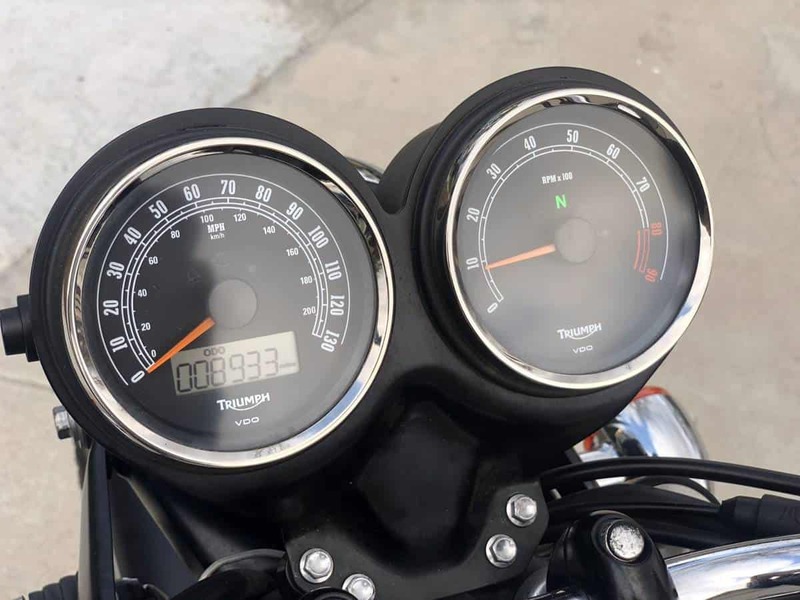 This entry was posted in Blog, For Sale and tagged 900 efi, For Sale, Great deal, Motorcycle for sale, Scramble machine, scrambler, triumph, Triumph Scrambler, twinline.